This spicy and rich Chili Ginger Miso Ramen is the ultimate comfort food. Making your own ramen is easy and it’s an healthy and nutritious alternative to the high-salt and high-fat instant ramen noodles you can buy in stores or fast food places. Making a your healthy bowl of ramen only takes three easy steps. Step one is making the broth. Step two is cooking the noodles. Step three is customizing your bowl of soup. This is my favorite part. Eating ramen is fun. You can jazz up your bowl of ramen with any ingredient you like. 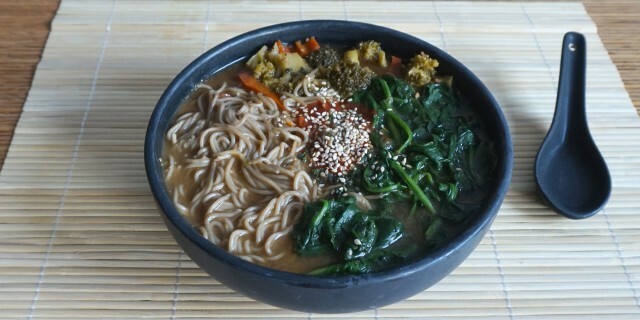 For this bowl, I have used gluten-free organic buckwheat ramen. Brown and black rice ramen are also great options. I have added steamed spinach and broccoli and just a sprinkle of sesame seeds, but I also love adding finely chopped green onions, kimchi and bean sprouts. Just top it off with a little -or a lot- of whatever you like, and slurp away! Cook the noodles in boiling water following the instructions on the package. Use one noodle cake per person. Strain and briefly rinse with cold water and set aside. Heat sesame oil in a pan and add the garlic, ginger and shallots. Saute over low heat until the shallots are caramelized. Add the stock and bring up to a boil. Reduce heat and simmer for at least 15 min. Then strain and put the broth back into the pot. Add miso paste, chili, rice wine vinegar, tamari soy sauce and lime juice. Let the broth simmer at low heat for a few minutes. Serve with fresh cilantro and any toppings you like. You can add Sriracha or any type of hot sauce for some additional heat and season to taste with freshly ground black pepper.